Trying a single speyside malt scotch whiskey. Yumm, thus far! We started with their 1991 but we'll have to save the others for another night. Before this, I have a Highland Park 15 which is a hard act to follow. 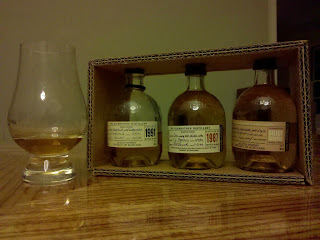 I'll have to give the Glenrothes another try since I think my palette is a bit exhausted and I'm a bit tipsy! I like scotch, yum yum yum. Scotch in my belly, yum yum yum.